Last weekend was a big one on our cattle ranch. We worked nearly 750 head of cows and calves for pre-weaning vaccinations and pregnancy checking. Our ranch crew is our family, plus the local veterinarian and we try to make the work fun--although you just can't camouflage the fact that it is work! 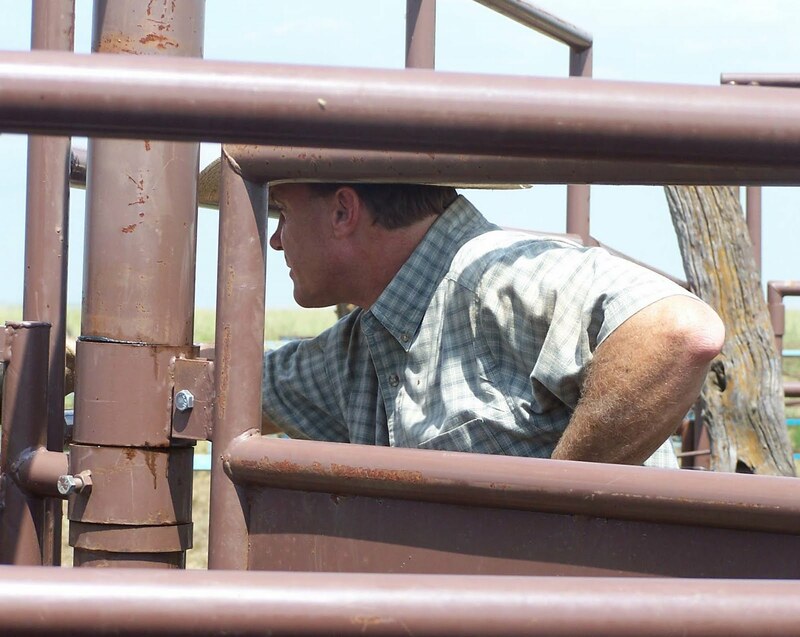 "Working cattle" is kind of an overall term for any kind of process that you must hold a cow or calf in a headgate to do. This past weekend it was time to pregnancy check the heifers that we raise to sell. If they are bred, we sell them as bred heifers in the fall, and if they are "open" (or not bred) then they will go to the feedlot. Each year we purchase heifer calves from people who buy our bulls, so we are buying heifers that are half our own genetics. We buy about 300 heifer calves and treat them right--the way we would want to treat them if we were going to keep them for ourselves: giving them vaccinations, health exams and tests, feeding them high quality feed, teaching them about people and handling them quietly. In the late summer, we hire the vet to check to see how many of them are pregnant and we give them the vaccinations that they need, then we turn them back out on grass for another month or so until they are sold. So last Friday morning, the family got up at 5:30 to be ready to gather 265 heifers by sunrise so that we could get the bulk of the work done before it got too hot. We were finished working by 2:00, so it was plenty hot, but we got it all done and the heifers did very well, with not too many of them being open. The rest of the weekend was spent working cows and calves. Each morning the family was at another pasture shortly after sunrise to gather the cows and 6-month old calves, sort them into separate groups and run the calves through the chute to be held in the headgate to receive their vaccinations. There are a number of diseases that we are able to vaccinate against and we are very strict about our cow herd health program. We consult with veterinarians at Kansas State University, as well as our local veterinarian to decide which vaccinations to give at what time of year. After receiving their shots, the calves are released back into the pasture with the mama cows for another 4 to 6 weeks until weaning. Everyone has their job to do on our working crew, but we were short one hand this year as our oldest daughter was already moved into her sorority house at college by the time we planned this work day. We missed her, but the rest of the kids did a great job keeping the cattle moving and giving shots. We also had a big picnic at the pasture when the work was done--complete with peach and strawberry pies! I just wanted to tell you how much I enjoy your blog! My husband and I also run cattle, and both work full time. He travels quite a bit, so I'm at home working, hauling, and feeding cattle by myself quite a bit. I think you're doing a great job, and It's nice to know there are others out there just like me! I really enjoyed reading through your blog. 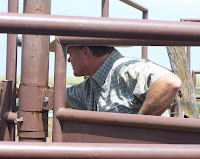 I find it so interesting to see how others run their ranches and farms. Hope you can stop by and visit me sometime. Always love hearing about how farmers and ranchers care for their cattle in different parts of the country. Sounds like everything is well thought out. What vaccines do you give at the different times of the year? Glad to hear the whole family comes together. One quick question, if you do your own A.I., why cant you also preg check yourself??? Just curious. Jenna: Good question. We do pregnancy check our own cows, but these heifers are for sale, and we like to guarantee them bred, and most people trust a vet more than the person selling the cattle. So we like to have a vet preg check anything we are selling. It is also important that he view these heifers and help supervise their health program, because he must write health papers to allow them to be shipped across state lines, if they sell to a guy in another state. This year we have shipped heifers to West Virginia, Missouri, Oklahoma and Nebraska!